It was May 2013 at the College New Venture Challenge competition hosted by the University of Chicago’s Booth School of Business when college seniors Shivani Jain, Arnav Dalmia and Ryota Sekin presented their idea for an elliptical, office-friendly exercise machine, the Cubii. It placed second and Fitness Cubed was born. Jain, a 20-year-old University of Chicago graduate, is now the chief marketing officer and co-founder of Fitness Cubed. Using the problem-solving skills she learned in her economics classes, Jain broke down the challenges the company faces when marketing for Cubii, which she and her co-founders call the world’s first under-desk elliptical trainer. Cubii is designed to cater to the vast majority of people who work at their desks for long periods and don’t have time for regular exercise routines. “We’ve experienced first-hand during our internships that sitting all day at desks wasn’t good for the body, and there wasn’t really something available that was truly accessible to people in the market,” Jain says. With the popularity of standing desks and treadmill desks, Cubii came at an opportune moment in the office fitness world. 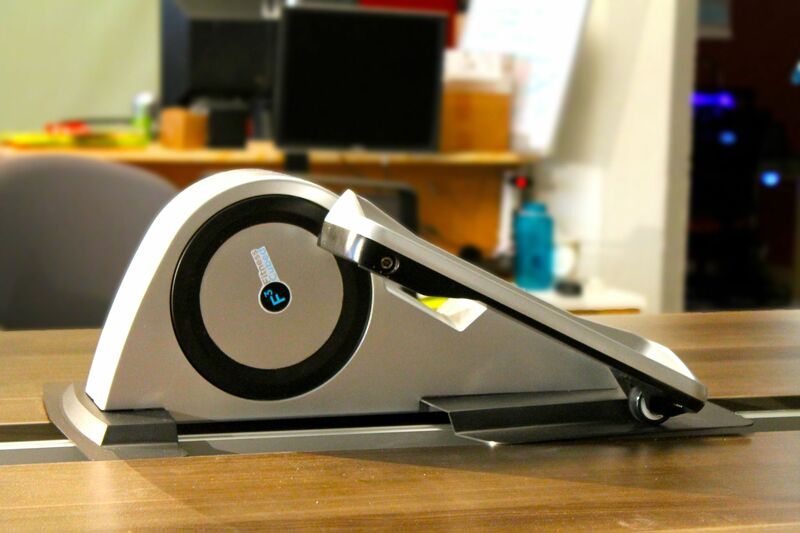 If you can’t afford a standing treadmill desk, the company pitches Cubii as a good substitute. The user pedals smoothly and quietly, to prevent distracting others, and the Fitness Cubed founders promise that the exercise isn’t strenuous enough to make you sweat; it’s just enough to keep you active. “We were interested in clean energy, so we were trying to find a way that you could power your entire office through exercise or movement,” Jain says. Jain and her team placed second at the CNVC competition, which allowed them to participate in university events that helped complete their model for Cubii. After months of work and feedback, the group began building the first prototype for Cubii. Campaigning with Kickstarter—the crowd-sourcing platform aimed at supporting creative projects—raised more than $300,000 in pre-orders that went toward manufacturing costs. “When we launched on Kickstarter, we ended up raising $300,000, which is almost 3.5 times [higher than] our goal amount. It was a pivotal point that we worked really hard for, and we gained a lot of confidence in our own idea,” Jain said. A combined lack of engineering experience did not stall opportunities for the Fitness Cubed trio, as they learned first-hand how to run and promote their business. The team used feedback from customers and professional backers to improve Cubii’s design and accessibility. However, taking an array of sometimes-conflicting suggestions stalled some decision-making. With two to three pre-orders placed every day, the team gained credibility—Fitness Cubed now has over 1,000 backers for Cubii. Although Jain plays a key role in Fitness Cubed, the company is not her only creative outlet. When she is not acting as the chief marketing officer, Jain is involved in Ms.Tech, a Chicago learning community that aims to address problems women face in a male-dominated field and gives them a platform to support one another.